There’s a new thread on 2+2 decrying the level of play at the conclusion of the 1987 WSOP Main Event as evidenced by 43-minute video of the final table you can watch on YouTube. It’s an interesting final table, with Bob Ciaffone, Howard Lederer, Dan Harrington, and eventual winner Johnny Chan among the final six. If you click on the link to watch, you’ll see the first few minutes taken up with introductions of the scene and players, then a quick primer on how to play no-limit Texas hold’em. 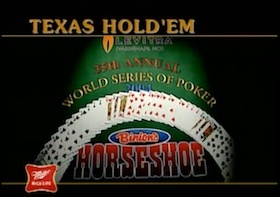 Those little instructional segments continued to appear as part of the ESPN broadcasts of the WSOP up through the start of the “boom,” although looking back I think by 2005 they’d already dropped them. At least I don’t see it at the start of the first episode from that year’s Main Event. By the way, I was just distracted by that opening show from the 2005 ME, highlighted by Jennifer Harman losing with queens full to Cory Zeidman’s straight flush (a river one-outer), some laugh-out-loud hilarity from Brad Garrett, Greg Raymer’s red-hot start where he picked up hand after hand and was consistently paid off, and 90-year-old Victor Goulding making quads in one hand then a little later being given a 10-minute penalty for cursing (no shinola). The instructional segments went away, of course, as more and more started playing poker -- many playing no-limit hold’em exclusively -- and it became apparent such explanations were mostly superfluous. Watching those segments today sparks a bit of nostalgia, while also calling to mind the effect they had back when we first saw them. For those of us who already knew what a flop, turn, and river were, the segments were perhaps a bit tedious to sit through, but I’m realizing today how they might have served as confidence-builders to some (or many?). Hearing someone explain something that you already know all about produces at least a couple of by-products, I think. One is a kind of self-affirmation, especially when the explanation checks out in all particulars with your own understanding. A second is the suggestion that someone actually needs the explanation -- i.e., that there are those whose level of understanding doesn’t match your own. In other words, while the how-to segments might have been designed primarily to help non-players understand the game they are watching, and secondarily as a way of encouraging some of them to give the game a try, they also certainly provided a measure of encouragement to those already familiar with the game. And as far as the level of play (by some) in those old shows is concerned, that, too, was certainly encouraging to many as well.